The ATC-2 (Advanced Tone Circuit) is a low power consumption preamp using a 9v battery. It allows you to use your guitars fully passive (unlike many preamps on the market!) 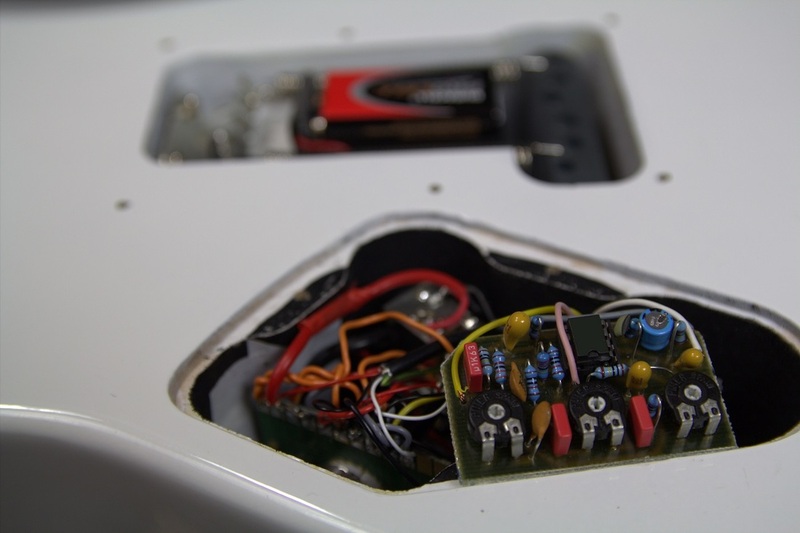 and with a switch or push-push/push-pull potentiometer you can switch your guitar to active mode. Active mode solves issues with cable capacitance from longer cable runs so you don't lose tone. It also makes your passive volume knob work much better: when rolling down the volume there's hardly any tone loss. Please send an email to info(at)gitaarservice.nl to discuss pricing and delivery time. The ATC-2 has controls for gain, bass and treble trimpots which allow you to really balance the passive and active guitar signals so there's no difference in tone. You can of course set the preamp to boost the lows or highs but in most cases a transparent boost is desired. You can see the ATC-2 as a second gain stage where activating it results in a boost that adds saturation and more volume/drive. This is especially noticeable with clean and crunch signals, with higher gain settings the ATC-2 adds more saturation but the difference in level/drive won't be as noticeable.